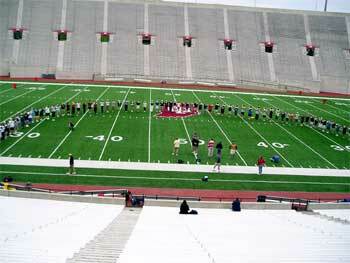 Saturday, May 29, 2004 was a special day for anyone who loves drum corps. After much planning and a few weekends of intense rehearsals, the Star of Indiana Alumni Corps performed brilliantly at the Indianapolis 500 Festival Parade and then went back to Bloomington to perform excerpts from several selections from the corps' past, and to celebrate 20 years of Star of Indiana with a big alumni gala banquet. Brought together by Star Alumni Association Director Josh Talbott and others, this was one of those events you had to witness for yourself to believe the quality of performance. Horn instructor Donnie VanDoren had the 116 horns sounding as good as ever, reminding one of the four high brass line honors the corps received its last four years in DCI competition. A Star of Indiana alumni rehearsal, taken back in April. Photo submitted by Christopher Rutt. Alumni showed up from almost all 50 states, Canada and even New Zealand and Holland, learning horn and drum parts and guard work to the "Overture from Henry V" for the parade. For the evening standstill, the 30 members of the drum line learned a cadence and the horns learned the corps' long-time warm-up chorale, the end of the 1991 "Roman Images" show, part of "Belshezzar's Feast" (1990), "Amber Waves" (1992), excerpts from "Medea" (1993) and "When You Wish Upon a Star" (corps song since 1985). The quality of performance was nothing short of stunning, leading one to believe that the performers never put down their horns over the past several years, despite knowing better. The parade was held in downtown Indianapolis, and it's supposedly one of the larger parades in America. People lined the route several deep for over two entire miles. Those in the audience were introduced to "The Star of Indiana Corpse (not a misspelling) Band, playing Henry Vee." I had a job during the parade, which was to be one of several water carriers for the members. In between performances, while the corps was still moving forward, the water bearers ran bottles water into the ranks and offered refreshment to anyone who needed it. A wagon being pulled along the side had large containers of water from which the bottles were constantly refilled en-route. I wasn't sure what to expect, and I sure didn't factor in what it would take to run between two lines that were moving forward, sometimes being backwards and not stepping on any toes. It was quite a workout. To be honest, I wanted to hear the corps perform "Henry V" as often as possible, and this was the only way to pull that off. And it was more than worth it. The intensity of the musical ensemble was stunning each and every time. The corps wore pink T-shirts with giant white stars. The 40 members of the guard spun flags that featured the Star Alumni Association symbol, a white star with pink in the lower left corner outside the star (the first uniform), red in the upper left (the second uniform), creamy beige in the upper right (the 1993 uniforms), and black below the star (the pants for most of the seasons). The point in the lower right of the star was missing, and a solid white from inside the star filled the lower right of the flag and the alumni association symbol. This, I learned, is due to the star not being complete without the corps' members. I'm not sure how all the marchers made it through the parade route. More than a few show signs, like me, of living outside the realm of constant exercise. I was told many members went into training in order to survive the parade, not to mention the effect on the lips. At the end of the route, many stood around for a few seconds, as if shocked at what they had just done. Then much jubilant celebration broke out and the organizers found themselves doused with the cold water that was handed out at the end. A little aside: I was sitting outside one of the corps' buses when Josh Talbott brought up a member who had requested to meet me. "You're Michael Boo? I've been reading your columns since I was a kid." It's always good to hear that someone has enjoyed my work, but to find out that the "since I was a kid" member is now 34 years old was a bit jarring. Outside the banquet, the corps went through the excerpts listed above. The sound was focused so tightly that it was truly almost scary. Afterwards, a banquet was held inside the new Cook Incorporated World Headquarters. Becky Saddlemeyer, drum major from the early years, was master of ceremonies. Dennis DeLucia, the corps' first drum instructor, and his fellow DCI PBS broadcaster Steve Rondinaro gave guest speeches, followed by corps director Jim Mason and corps founder Bill Cook. There was much laughter and a few tears. It was hard to believe the corps has been off the field since the end of 1993. The three Brass Theater years had given way to successful runs of "Blast!" and "Cyberjam." Members of each of those post-DCI productions were in the alumni corps. Bill Cook reminded all that Star didn't disappear; it just evolved into something different that made quite an impact when he unwrapped the Tony that "Blast!" won a few years ago for being the best special production on Broadway. Now, a few days later, it all seems like a dream. But for a brief time during perfect weather in Indianapolis and Bloomington, the past came alive again and those who missed Star had a chance to relish in its rebirth as an alumni corps. I hope there are more functions where more corps fans will be able to witness this blast (pun intended) from the past. Members were most eager to carry on, to get together again and do it all over. The rest of the activity should witness this ensemble. Further information can be found at staralumni.org, and anyone who's a fan of the corps' years on the field should purchase the retrospective DVD that contains all nine of the corps' DCI shows. This product is available from DCI for $39. Congratulations to all who made the parade and standstill performances a reality, to all to sacrificed to learn the music and guard work and all who instructed and did other things to complete the mission. It was truly a happening to be cherished.